What Happens After a Surge? Imagine that you decided to hold off on investment in stocks until there was more certainty about the economy. While you held the money in cash or bonds, your diversified stock portfolio surged more than 10% in a single month. At this point you feel bad missing out on such a gain, but are even more nervous investing the money, given the risk of a correction – a decline that corrects excessive recent gains. This article reviews the performance after all months with 10%+ gains in recent history. Note that this article applies only to Long-Term Component by Quality Asset Management. The chart below presents the Long-Term Component performance after all months with 10%+ gains, based on simulated data since 1970. For example, the 2 year returns (the middle bar) following these high-gaining months were anywhere from +2% to +47%, with an average of +23%. After these high gaining months (10%+ returns), there were typically no corrections. The following month still had positive returns, on average. This was true in all other measured periods (1-5 years). Not only returns were typically positive after these high gains, they were substantially higher than the average returns. 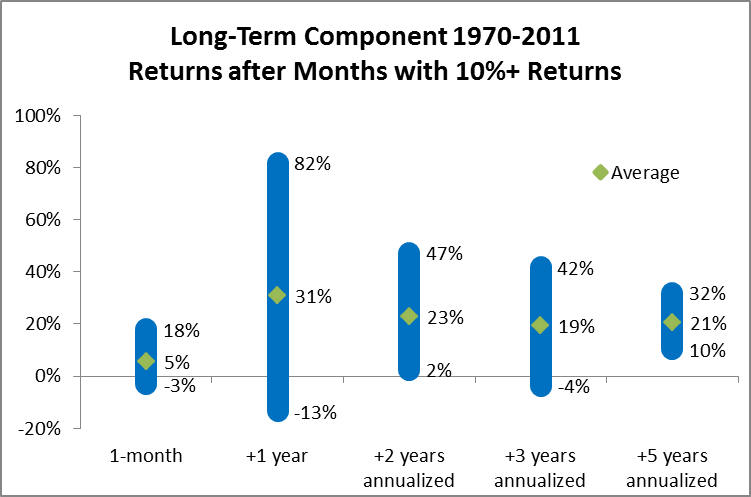 The average monthly return after 10%+ monthly returns was 5%, more than double the typical monthly returns. The average 1-year return, 31%, was about double the average performance of the portfolio in an average year. The 2-, 3-, and 5-year returns were still higher than average, typically 20%+. If you are surprised seeing these results, it is for a good reason. Stocks go up by a certain average in the long run. It is reasonable to expect extreme outperformance in one month, to be corrected with poorer performance following that. The results above contradict this logic, and show continued outperformance both in the short-term (the following month) as well as long periods afterwards – 1, 2, 3 and 5 years. Extreme gains, such as 10%+ in one month cannot typically be justified by exceptional performance of the companies. They usually occur as a correction to poor performance. This is typically accompanied by low valuations, i.e. low price-to-book or price-to-earnings, which would justify price appreciation above and beyond any growth in the book value of the companies. At times like this, the 10%+ gain is often one of the initial phases of a correction, which explains the continued exceptional returns. If you are a disciplined investor, and adhere to your plan at all times, this information does not have much practical value to you, other than giving hope for potentially exceptional gains following months with extreme gains. If you deviated from your plan, and kept more reserves than specified, this article should give you the courage to go back to sticking to your plan. While there are no guarantees for gains in all cases, and the future can be different than the past, the historic numbers combined with the logic behind them should give you comfort that you are at least going with the odds.